DUBLIN — Thanks to a miraculous aligning of discount Ryan Air flights, sunny weather and an approved three-day pass, we booked a spontaneous trip to Dublin, Ireland. If you’ve never thought about traveling there, you should consider. The country boasts food that is a contemporary blend of American, Parisian and Irish cuisines. And many restaurants select food from organic farms and local vendors. The city is alive with music, vibrant pubs, friendly city dwellers and a sophisticated young population. The lodging website Airbnb offers an abundance of affordable houses and apartments, but plenty of hotels and hostels are also readily available throughout the city. If you fly out of Frankfurt Hahn airport, park at a private lot. It will save you up to €50 in transportation expenses. This itinerary is based on my travelling preferences with my husband, which includes great food, drinks, museums and historical landmarks, and the suggestions of locals we met during our trip. If you follow our footsteps, bring some comfortable shoes — we walked ten miles — and about €300 for food, shopping and worthy tours. Take Dublin Bus, the local commuter’s preferred method of public transportation, to the city center. A one-way ticket is €3.10, as opposed to Aircoach Express buses, which charges €7 for the same trip. All buses are just outside the terminal. Board the bus using Route 16 at Stop 7347, and climb the stairs to the upper deck. Dublin Buses leave every half an hour, and it takes about 30 minutes to arrive downtown. Nestled in the heart of Dublin’s Temple Bar district, this lunch spot has some seriously good food. The beef is of Irish origin and all burgers are prepared in house. We ordered a burger with buffalo mozzarella, pesto and roasted tomato and hand-cut fries, but the salads and main dishes looked just as thoughtfully-crafted and delicious. If you do nothing else in Dublin, you must visit the Guinness Storehouse. A few steps off Dublin’s main block, the massive complex has seven interactive floors that break down the iconic beer’s brewing process. At the end of the tour, visitors pour their own pint of Guinness and drift upstairs for a 360-view of Dublin. Buy tickets in advance online for a 10% discount. About a ten-minute walk away, the Port House Pintxo has a creative tapas menu with an Irish flair. Try the Pepito Solomillo, mini grilled sirloin steak on garlic toast, and the Paelle de Verdura, Spain’s traditional rice dish. The company also owns an incredibly cool, multi-level bar just around the corner. Established in 1198, the Brazen Head is Ireland’s oldest pub. It was referenced in James Joyce’s book Ulysses, and the small venue offers live music every night with a great beer selection. Green 19 is a hidden gem. It is owned by a young guy with a killer beard and loads of suggestions for tourists. The restaurant has a straightforward concept: a simple menu and affordable food. Order the “Full Irish” and porridge for a traditional Irish breakfast. Time to walk off breakfast and do some sight-seeing. These sites were all founded in the 11th and 12th centuries and are about five minutes apart. Together, they capture Ireland’s rich history and cultural roots. Museums and services are also located in each at a reasonable price. 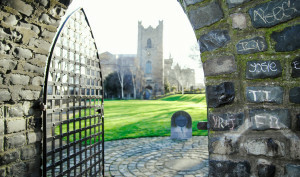 Easily the most romantic walk in Dublin, Trinity College is Ireland’s most prestigious university. The architecture and landscaping compete with the world’s oldest academic institutions for beauty and sophistication. Also, visit the college’s museum, which houses Ireland’s national treasure: The Book of Kells. The self-guided tour walks visitors through the stages of illuminated manuscripts and showcases various pages from the ninth-century book of Christian gospels. Tickets for the museum tour are €10 each. The Farm is the health-conscious and environmental crusader’s dream come true. Focused on local, free-range and organic food sourcing, the restaurant has a seasonal menu with contemporary Irish selections. Weather-permitting, walk through Dublin’s famously ever-green park. Ducks and swans bathe in the lakes, young couples dine on picnic blankets and kids splash in the fountains. It’s a great break from Europe’s grey winters. Since you’re in the area, why not meander down one of Dublin’s main shopping strips and pick up some souvenirs? If you’re not the shopping type, though, Old Jameson Distillery is about 15 minutes away and they have some excellent tours and tastings. Buy online and save 10 percent at €14.40 per ticket. We saved the best for last. The Winding Stair, which is named after a Yeats poem, is a restaurant stationed above an old restored Irish bookshop. The restaurant is quickly becoming one of Dublin’s favorite food hot-spots, so be sure to book a reservation in advance. Walk past the Hard Rock Café and into this highly-regarded, historic Irish pub. A bartender recommended it, and we’re so glad he did. The pub is known for its beer and whiskey. ONE FINAL TIP: Use the “Route Planner” on Dublin Bus to identify the nearest bus stop and save euros on your trip back to the airport.